Hair loss is something no woman wants to encounter; however, there are several different types of hair regrowth vitamins for women that can help jumpstart hair's growth cycle. Taking a good vitamin can help grow short locks longer, or encourage new hair growth to fill in thinning patches. Several key vitamin complexes help jumpstart hair regrowth in women. Many are common nutrients found in daily multivitamins. However, you'll need higher percentages than those found in a multivitamin in order to promote hair regrowth. Vitamin D, a group of fat-soluble secosteriods, helps enhance calcium and phosphate absorption, in addition to being a major player in helping your hair grow. The Journal of Investigative Dermatology recently highlighted a study showing that Vitamin D given to mice helps stem cells grow new hair follicles. The study also notes that a lack of the vitamin in the body can hasten the hair loss process. Biotin is an important vitamin for hair regrowth. It is in the B-complex family of vitamins and it functions in fat metabolism, which is essential for hair growth. An inadequate supply of biotin can actually cause hair loss. Vitamin E helps promote hair growth by stimulating the scalp and blood circulation. It is also an important antioxidant that helps fight free radical damage. Vitamin E works to boost hair growth by creating a healthy scalp, which is essential for proper hair growth. Selenium helps the body utilize protein and can promote hair growth over time. Selenium can potentially double your hair's growth cycle. It's important to note that excess amounts of selenium can be toxic, so never exceed the recommended dosage. There are many different vitamin brands that offer hair regrowth vitamins for women. Hair care brands such as Bosley and Nioxin, which are known for their shampoo, conditioner and styling products, also have hair growth supplements in their collection of products. Bosley Healthy Hair Vitality Supplement for Women combines a blend of nutrients to strengthen and fortify the hair shaft, promote thicker-looking, fuller hair and boost hair growth. The supplement also creates a healthy scalp, which is important for growth. Nioxin Intensive Therapy Recharging Complex is a multivitamin supplement that features a blend of marine concentrates to help jumpstart hair's growth. The formula also promotes healthier skin and nails with daily use. 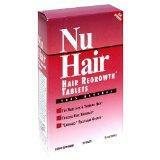 NuHair Hair Regrowth for Women is a natural supplement that nourishes the scalp and enhances hair growth. Ingredients such as biotin and horsetail extract help rebuild hair density and promote hair growth. In addition to supplements, women with fine or thinning hair should use shampoo, conditioner and styling products with ingredients such as saw palmetto and biotin to help create stronger, thicker and longer hair. With the right vitamin supplements and a little extra help from hair care products specifically for thinning hair, you can help boost hair growth for longer and stronger hair.